There are numerous front suspension modifications available for the MGB model, and we are aware that the average MGB owner's pocket book is the controlling factor when making a decision on any these suspension upgrades. Currently the trend is towards the coil-over arrangement, which requires crossmember modifications. 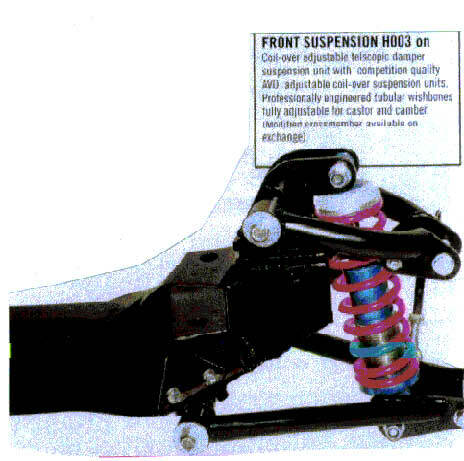 We will keep you updated on the performance merits of these two suspension systems, as they become available. The other type of suspension conversion is the telescopic conversion by Ron Hopkinson which, we have recommended in the past. This conversion has no provisions for caster or camber adjustments. Therefore, it would be advantageous to update to a fully adjustable coil-over front suspension system. The following information should be read in conjunction with technical articles MGB4 MGB13 MGB15 and MGB27. MGB and MGBGT (chrome bumper -> 74.5). Front 13.5" Rear 13.5". MGB and MGBGT (rubber bumper 74.5 ->). Front 14.5" Rear 14.5". Before replacing front or rear road springs measure the existing ride height. Installing new springs may not achieve the ride height you are looking for. We find that many times MGB owners replace road springs to rectify "leaning" problems. To their amazement some owners are mystified that their MGB is still "leaning" to one side or the other. We discuss this problem in depth within technical article MGB4. Your MGB front suspension must be allowed to work. 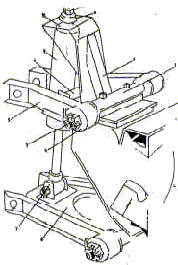 The front suspension working distance is controlled by the bump stop/rebound buffer assembly. Lowering the front vehicle ride height will reduce this distance. Installing a shortened assembly can rectify premature contact with the bump stop. Your front suspension should have approximately 6" working distance. The rule of thumb is, for every 1/2" change in ride height, the bump stop clearance will increase or decrease by approximately 5/16". Exaggerated lower a-arm angles, resulting in excessive negative camber path geometry. This will produce a "Twitchy" steering response especially during turn-in, which could lead to premature oversteer. Also, "Bump-Steer" will be a problem, especially when fitted in combination with negative camber lower control A-arms and OEM shock absorbers. Fitting revalved OEM shock absorbers will improve the situation somewhat. Excessive loads on tires, tie-rod ends and other steering/ suspension components should be avoided at all times. As of the time of writing, we believe that fitting of the following suspension components will contribute to improving the way your MGB vehicle handles. 1 454-945 3/4" Sway Bar. Kit contains complete new upper mounting bracket assembly with Bilstein gas charged telescopic shock absorber. (Requires cross member modification). Available by direct purchase. Contact Ron Hopkinson MG Parts Center UK 011 44 1332 756 056. If your budget does not allow you the opportunity to purchase the above kit, then we recommend the following substitute. Another alternative is to contact APPLE HYDRAULICS @ 1 800 882 7753 or visit their Web Site www.applehyraulics.com for information on their shock absorber rebuilding program. 1-2 264-325 Spring Shim- Raises ride height approx 3/16" Note: 2 Maximum per side. 1 8G621/NEG Nylatron Upper Offset Bushing (set) Changes camber + or - 1/2 deg.